The Indian Ocean played a far greater role in driving climate change during the most recent ice age than previously believed and may disrupt climate again in the future. That’s according to a new study from The University of Texas at Austin, the findings of which could rewrite established Pacific-centric theories on tropical climate change. The study was published Dec. 12 in Science Advances. UTIG is a unit of the University of Texas Jackson School of Geosciences. The scientists investigated changes in the climate of the tropics during the Last Glacial Maximum (LGM), a period of the ice age 21,000 years ago when ice sheets covered much of North America, Europe and Asia. Although scientists know the tropics changed radically during this time, they did not understand what was driving these climate changes until now. Today, the Indian Ocean is characterized by uniformly warm and stable rainfall patterns. This is because the prevailing winds blow from west to east, maintaining warmer waters over the eastern side of the region and bringing rainy conditions to countries such as Thailand and Indonesia. During the LGM, however, the tropics were struck by dramatic changes, including a reversal of prevailing winds and uncharacteristic changes in ocean temperatures. “The geologic record tells us that Indonesia and the monsoon regions of the east Indian Ocean became drier and cooler while the west became wetter and remained warmer,” said co-author Jessica Tierney, a paleoclimatologist at the University of Arizona. 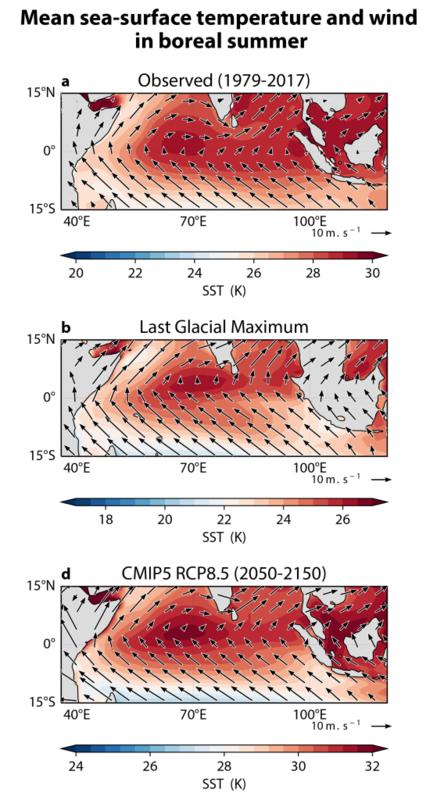 To find what drove these changes, researchers used a climate model to simulate how various glacial conditions affected climate. They compared simulated outcomes with paleoclimate data (chemical signatures about our past climate stored in rocks and ocean sediments). Scientists know that as ice sheets advanced over Canada and Scandinavia, sea levels lowered by as much as 120 meters (nearly 400 feet), creating vast continental bridges stretching from Thailand to Australia. According to the climate model, these new land masses reversed the prevailing winds, blowing seawater to the west and allowing cold water to cycle up to the surface in the eastern Indian Ocean. The findings are important because they reveal that the Indian Ocean is capable of driving radical changes in the climate of the tropics and that climate models are able to simulate this complex process. “Now that we have reproduced glacial climate conditions for the Indo-Pacific region, we are more confident that the same climate model can be used to predict our planet’s future,” said co-author Bette Otto-Bliesner, a climate modeler at the National Center for Atmospheric Research (NCAR). Understanding how climate changed during glacial intervals could also tell scientists much about what drove human migration into Asia, Indonesia and Australia. “By lowering global sea level and influencing weather patterns, glacial ice sheets impacted climate in key migration corridors,” said co-author Axel Timmermann, director of the IBS Center for Climate Physics in South Korea. What’s more, the mechanisms driving these climate changes may be unique to the Indian Ocean. This is especially important for predicting how rainfall in the tropics will change because current theories focus on the influence of the Pacific Ocean. Although the study did not specifically investigate whether these climate mechanisms will emerge as Earth warms, the authors believe the role of the Indian Ocean should not be forgotten in making predictions for our warming planet. The study was funded by the National Science Foundation, the David and Lucile Packard Foundation, NCAR and the South Korea Institute for Basic Science. The climate model used in the study is the Community Earth System Model, co-developed by NCAR and a community of U.S. modelers. Paleoclimate data is a collection of evidence about our planet’s past climate found in ice, rock and ocean sediments, known collectively as the geologic record. By studying minerals and fossils preserved in sediments, rock and ice, scientists are able to guess whether the climate was warm or cold, how much or how little it rained, whether large forest fires occurred and even estimate the strength of past storms. Recent advances in geochemical analysis has allowed scientists to create an even clearer picture of what the climate was like 21,000 years ago.